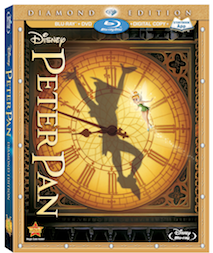 This Tuesday, February 5th, Disney celebrates the 60th Anniversary of Peter Pan by releasing the Diamond Edition Blu-ray release. The movie has been digitally enhanced to bring out both better color and sound. As this is one of my favorite Disney movies of all time, I can’t tell you how excited this release has made me, and being allowed to review the Blu-ray early has been a treat. For more information about the movie itself please check out Episode 63 of our podcast. When you get to the main menu of the Blu-ray be prepared for a visual treat. The main menu background is a shifting of scenes throughout Neverland. The scenes shift by moving through a 3D representation of Never Land led by none other than Tinker Bell herself. If you head to the sneak peeks you’ll a preview for the recently cancelled theatrical release of Little Mermaid in 3D on the Sneak Peeks. And for Tinker Bell fans who haven’t already seen it on YouTube, there is a preview of the The Mythical Island - a movie where the talents of the Tinker Bell and her friends get jumbled between them. Audiophiles will be happy to find that they can use the Original Theatrical Mix audio when watching the movie - this might require special audio equipment to get the full effect. You can also use DisneyView to displays artwork by Cristy Maltese in the left and right borders of the movie on modern displays that are otherwise black. And if you don’t want to watch the movie with full subtitles to be able to get them just for the song lyrics throughout the movie you can take advantage of Sing Along With The Movie (With Lyrics). You can also find all the old DVD release “classic” bonus features on the Blu-ray. Prior to the movie you have the option to watch an introduction by Diane Disney Miller where she talks about Walt’s love of the story and how he had wanted Peter Pan to be the 2nd animated feature, but he had to wait until animation techniques caught up with his vision. You will also find the short Growing Up With Nine Old Men which is a brief background and history of Walt’s Nine Old Men. It is narrated by the son of Frank Thomas, Ted Thomas director and writer of Walt & El Grupo. In it he goes around to some of the children of the Nine Old Men and discusses with them how it was growing up with their fathers. And if you want to you can listen to Audio Commentary by Roy Disney while you watch the film. When I first experienced the concept of an interactive Disney Intermission on The Muppets Blu-ray I was floored by the concept. This Blu-ray has a similar feature, but it is very slow paced and not as much fun. Geared toward children, it takes you through some puzzle-like interactions with voiceovers by both Hook and Smee. There are also two deleted scenes which are enacted using the storyboard technique that Disney has used on prior Blu-ray releases. As I really enjoy this method of putting together a missing scene this feature is a treat for me. There are also two missing songs “Never Smile at a Crocodile” (music is in the movie, but not the lyrics) and “The Boatswain Song” which is all about Smee. This Blu-ray release is fantastic. If for no other reason the digital enhancements to the movie itself make it perhaps the best version of the movie ever released. As it’s a popular fan favorite, I think this release will have excellent sales. While there’s very little additional new content on the Blu-ray itself, considering the age of the movie and the amount that already exists about it, this is no great surprise. The inclusion of the DVD bonus features is smart, there should be no Blu-ray release by Disney that shouldn’t do this for any prior release content. I’m glad to have received a review copy of this release. Sounds like this one has better bonus features than the previous DVD release, which was almost bare-boned. Shame Walt's second TV special that promoted the film has been lefted out again.